Guess who's handwriting this is? 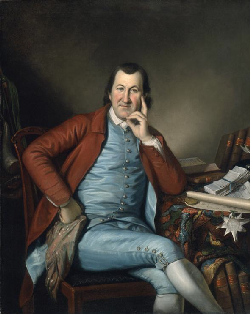 and apparently "kept his faculties"
Timothy Matlack (c. March 28, 1730 – April 16, 1826) was a merchant, surveyor, architect, statesman, and patriot in the American Revolution. A delegate from Pennsylvania to the Second Continental Congress in 1780, he emerged during the Revolutionary period as one of Pennsylvania's most provocative and influential political figures. "As a clerk to the Secretary of the Continental Congress, Matlack was chosen to inscribe the historic document that now rests on display in the National Archives." That historic document? The Declaration of Independence. Modern computer fonts have been made in the likeness of his script. He also served as a witness during the court martial of Benedict Arnold. That's just a little bit of what he accomplished in his life. 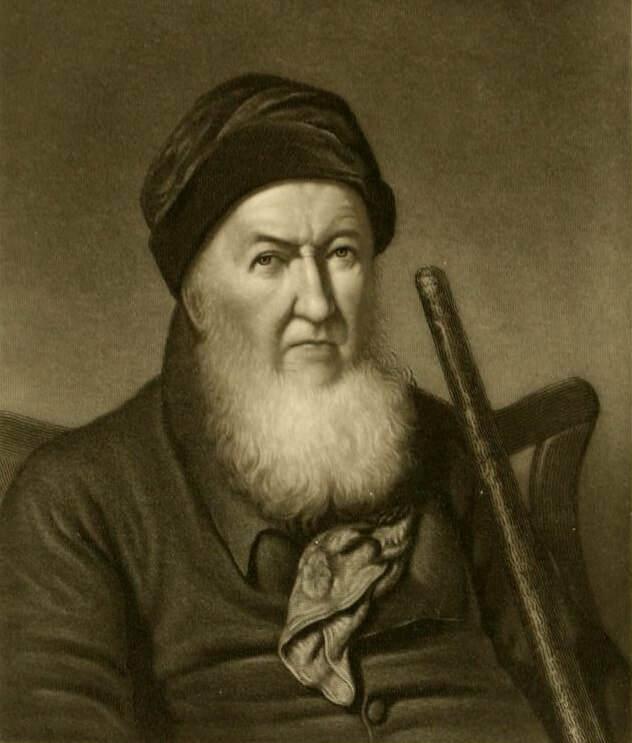 White Matlack (7 Oct 1745 - 7 Jan 1824), brother of Timothy Matlack above. Was born in Haddonfield, New Jersey and died in Bayside, Queens County, New York. 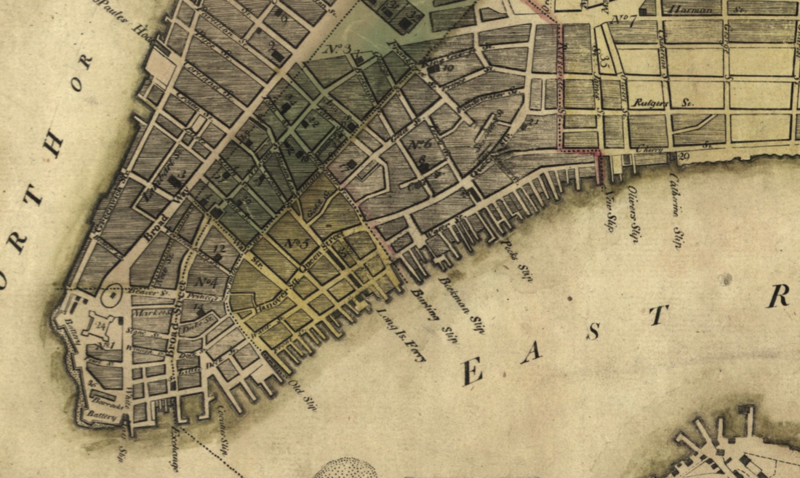 He was a watchmaker and silversmith in New York City and in 1790 had a brewery on Queen Street (now Pearl Street) near the famous Fraunces Tavern in Manhattan. Both he and his brother Timothy were disowned by the Quakers because of their support of the Revolution. Together they started the Society of Free Quakers .White was active in the New York Manumission Society which founded the African Free School. He was a member of several societies and was an officer in some along with very notable New Yorkers, future Governor of NY John Jay, and Robert Troup, a colleague of Alexander Hamilton. He lived on Queen Street in Manhattan at the same time that Alexander Hamilton lived on Wall Street, right around the corner. His father-in-law (Hawxhurst) also was a clock maker on Queen street so it's quite probably that's how he met his wife Mary Hawxhurst. I'd say it's a pretty good bet that he knew Hamilton very well and probably Aaron Burr too. White Matlack and his miniature portrait of George Washington were featured as the 2nd story in Season 7, Episode 7 of the History Detectives. Wikipedia page for White Matlack lists his many accomplishments. Its seems we may have another famous person who we share an ancestor with. If this is accurate, George W. Bush may share an ancestor in the Haines line! He would be descended from Richard Haines as well. A few years ago, when George & I first moved to the Shamong area, we went to an antique flea market at Atsion Lake. 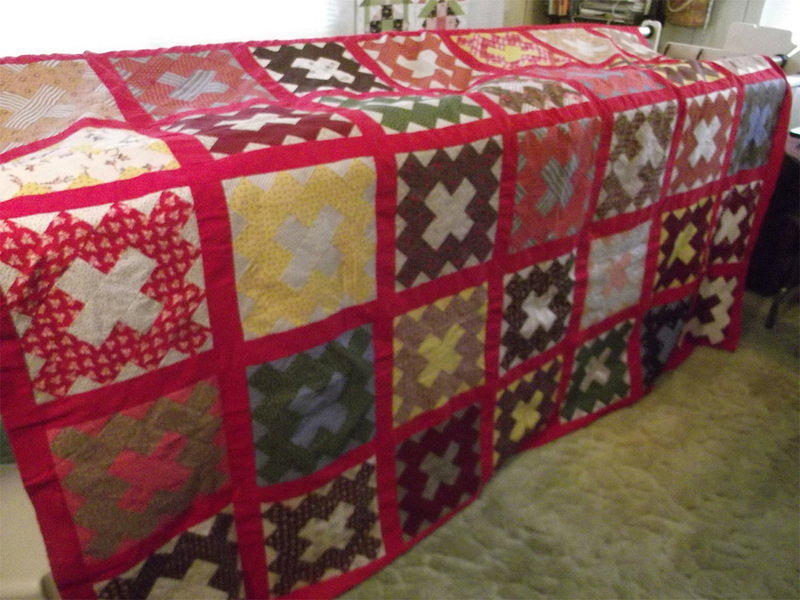 While walking around, I came across a quilt top lying on the ground at one of the vendors, I asked the price and paid it, to my surprise, it cost $5.00. I knew it was old, and it smelled a little musty. So I called my favorite Quilt Shop, and asked how to clean it. 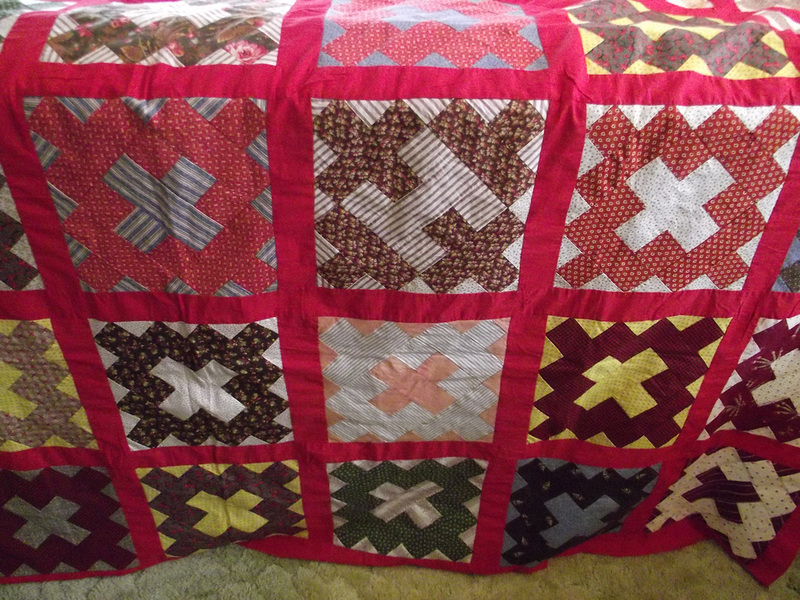 I was advised not to wash it in the machine as it was not quilted, it is only a top. Also I was trying to find out what pattern it was, so I took it to my favorite shop, and I found out that it is called an album block or friendship block, which means that the center of each block can hold a signature, esp. if it is presented to someone who is leaving the area. It has 48 album blocks, one block is the letter H, so I said that I was meant to have it, meaning my name. But now, I think of all the Haines that were in this area, it could be possibly be from one of them, at least that is what I like to think. I had it appraised back in 2009, it is from C. 1885, some of the fabrics date back to 1865. And it was valued at $200. To me it is priceless. After reading the poem about the sewing machine (below), I now realize why I don't like to mend. I am a quilter, and that's the only sewing I want to do. And yes, I am a Jersey Haines. The colors are still so vibrant! The Concessions and Agreements of West Jersey in America - (commonly called the West Jersey Constitution) - Along with William Penn, two of our ancestors signed this historic document in London in March 1676/77 (March was the beginning of the new year then). John Paine, our 8th great-grandfather, and John Borton, our 7th great-grandfather. 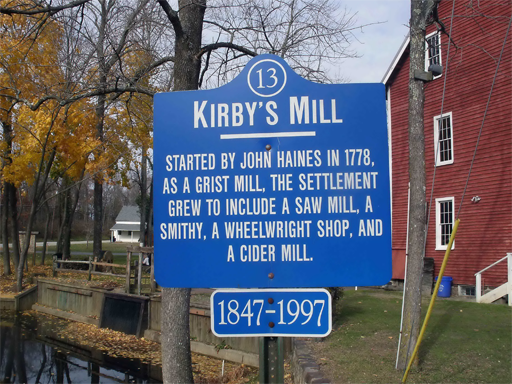 John Haines, our 7th Great Grandfather, is said to have been the first recorded farmer in Medford history to be able to sign his name (as opposed to a mark). Quakers weren't always meek, mild and innocent! Dr. Phoebe Haines Sharp - First white settler and doctor in Logan County, Ohio. Interesting story of her life and she's from our Haines family in Burlington County. Of particular interest is that she mentioned one of her ancestor's portraits hanging in Independence Hall! I am unable to find a list of portraits hanging there but if someone wants to take a trip across the bridge and have a look, let me know! I came across this 1858 poem while combing through a compilation of the "Friends Itellingencer," a newsletter from the Quakers of Philadelphia. This further illustrates to me that I would have never survived in those times! It was reprinted in the Intelligencer from the Springfield Republic. The joyful tidings to all my friends. My Wheeler and Wilson's Sewing Machine. Bless me ! the trouble was only begun ! It was always, " My dear, this shirt is not right,"
Were too large or too small, I could never tell which. Though the first might be right, yet no other would be. Men had better keep still on the matter of dress. I think it would be on the subject of shirts. I would now quite as lief have a husband as not. I thought he would kiss my Sewing Machine. But then, dear me ! it was nothing at all! To my all-sufficient Sewing Machine. That my own private wardrobe was somewhat neglected. Thanks to my good little Sewing Machine. Enough to last us for twenty years. So soon after buying a Sewing Machine. But, my dear, 'tis the subject of the age! Sewing Machines, and those who have not. Who sit and sew the old-fashioned way. What these wonderful things may be? But come with an extra trunk full of work. Without taking with you a Sewing Machine. Thomas Haines Dudley - His efforts as a delegate at the Republican national convention were said to have been "greatly instrumental in the nomitation of Abraham Lincoln" and was later appointed Counsel of Liverpool by President Lincoln. We mostly know of his name by Dudley Street and Dudley Grange. We walked through the park to get to Woodrow Wilson High School and we ate our lunch sitting on the wall by the sidewalk. His mother was Ann Haines, a descendant of William Haines, brother to our John and Thomas Haines (7th great grandparents) and makes him our 1st cousin, 7 times removed. 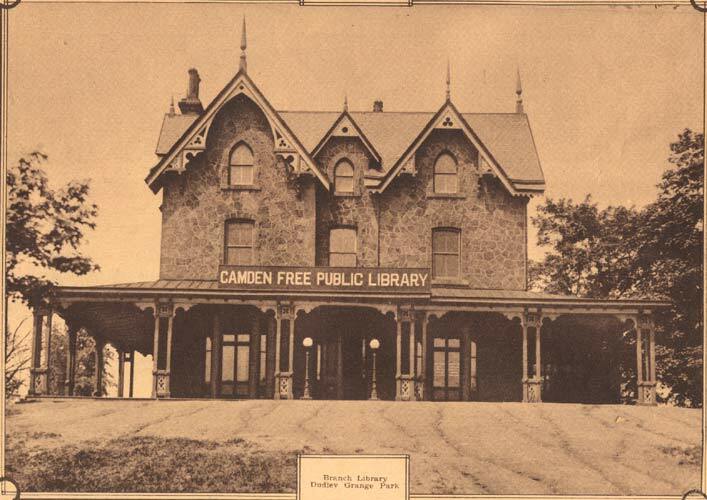 The picture was taken in 1928. I was sad to read that the building was destroyed by fire in 1980 after the Camden Free Public Library abandoned it. I remember finding a book years later that I'd taken out of there! Build fire in back yard to heat kettle. Shove one whole cake of lye soap in boiling water. Sort things. Make 1 pile coloured, 1 pile white, 1 pile breeches and rags. Stir flour in cold water to smooth. Think down with boiling water. Starch. Rub dirty spots on board, scrub hard then boil. Rub coloured but don’t boil. Just rinse and starch. Take white things out of kettle with broom handle. Then rinse, blue and starch. Spread tea towels on grass; others on fence. Put rinse water on flower beds. Scrub porch with soapy water. Turn over the tubs to drain. - Anonymous note (c. 1900) on display at the Whistler Museum and Archives in Whistler, British Columbia.